Celebrating the life of Ottie Ray Sides, Jr.
Be the first to share your favorite memory, photo or story of Ottie . This memorial page is dedicated for family, friends and future generations to celebrate the life of their loved one. 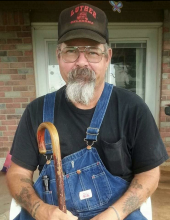 Obituary for Ottie Ray Sides, Jr.
Ottie Ray Sides, Jr., 65, passed from his earthly life to go be with his Lord and Savior and his beloved wife, Jill. Jr was very strong in his faith and never missed an opportunity to give his testimony. Jr leaves behind his oldest daughter, Sara and husband Kelley of Luther, OK; son, Mike and wife Crystal of Harrah, OK; daughter, Liz and husband Brad of Alex, OK; and his youngest daughter, Ashely and husband Josh of Tecumseh, OK. His greatest joys was and still is, are his grandkids, Amanda Ray, Megan Elizabeth, Michael Jr. “MW”, Kayla, Zack, Brooklyn and baby Lexi; and many more. A memorial service to celebrate Jr’s life will be 7PM, Saturday, December 1, 2018 at Barnes Friederich Funeral Home Chapel. To send flowers or a remembrance gift to the family of Ottie Ray Sides, Jr., please visit our Tribute Store. "Email Address" would like to share the life celebration of Ottie Ray Sides, Jr.. Click on the "link" to go to share a favorite memory or leave a condolence message for the family.